Shark Tank television show in which budding businesses pitch their own proposals. Moneythink is a nonprofit organization composed of University of Chicago students. Students Ted Gonder, Greg Nance, Shashin Chokshi, and David Chen founded Moneythink during the 2008 financial crisis. Moneythink has since expanded into a national nonprofit organization of 30 chapters throughout urban areas in 10 states. Occasionally, the UChicago group collaborates with Moneythink Northwestern and Moneythink Loyola, the other two Chicago-based chapters. 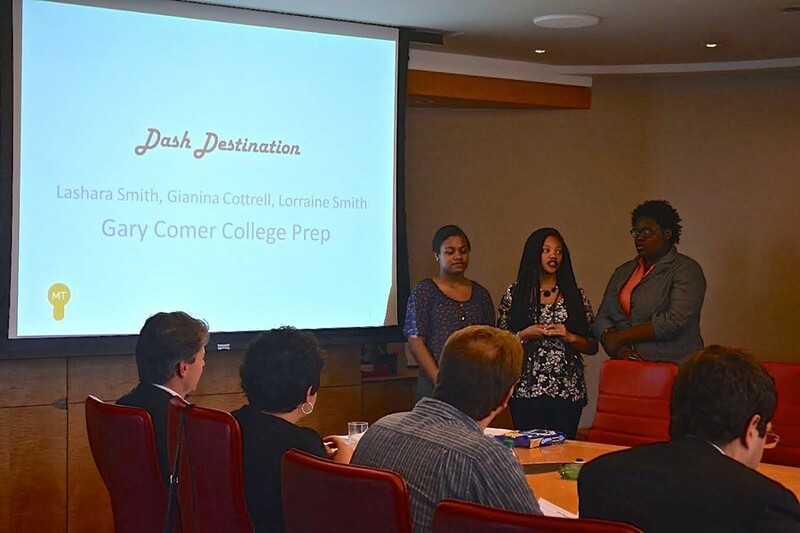 At the Money Tank conference, students from Urban Prep Englewood, Gary Comer College Prep, and the University of Chicago Charter School Woodlawn Campus advertised their own business models to bank directors, associate consultants, and nonprofit managers. The Moneythink team sponsored the event with partners from banks, including The Parthenon Group, Burling Bank, Shark Tank alumni, Future Founders Foundation, and nonprofit board members. The team invited Ariel Investments to host the event after the company visited the University earlier this year. Urban Prep Englewood won the competition and received a grand prize of iPads, which were donated by Moneythink mentor and student Jason Li’s UProspie and iReTron businesses. Gary Comer College Prep, the runner-up, received $100 gift cards. Urban Prep Englewood came in first after proposing their project, Game Head, an online marketplace where people could buy and sell used video games. The judges ultimately preferred the team’s pricing structure, branding and marketing plans, and predictions about competition. Li said the event was a part of Moneythink’s initiative to expose students to the financial world. “We want to teach business and entrepreneurship…and it’s always been a goal of mine to enhance business literacy to high school students, so I’m very lucky to be working with this team. We usually try to have a fun event every spring quarter, but this year we wanted to try something more entrepreneurial,” he said. Moneythink President Dalton Schmit wrote in an e-mail that the organization was created to build the financial health of America. “Financial institutions must work to better serve everyone, but we must also work to make sure that everyone is informed of how they can become a part of the traditional financial world…. We know that one of the best ways to break through the barriers of poverty is to have a strong education, and we want to help facilitate that,” he said. Mentors teach high school students the basics of business, including saving, budgeting, goal-setting, teamwork, and credit and debt concepts. They help high school students create businesses in areas of investment from sports to retail and connect them to local business owners and professional investors. Moneythink mentor and second-year student Shubham Chandra said that help from mentors in other academic areas ensures a strong educational foundation for the students. “Moneythink was founded on the fundamental principle that financial literacy is a valuable skill to empower and enable students to live better lives. It seeks to complement any high school education with skills that let them show what they know to the best of their abilities. While students may or may not apply their biology, or math knowledge, financial literacy is a topic that touches everyone at every point in their lives,” Chandra wrote in an e-mail. The mentors currently teach at five high schools on the South Side of Chicago, where they teach at least one finance class per day at each school. The mentors also help students edit college essays and manage their time between school and extracurricular activities. Schmit and Li said that the team hopes to have at least one event like the Shark Tank Conference every spring quarter, along with other events and workshops every quarter. Last quarter, Moneythink invited two speakers and took an on-site visit to software company kCura. This quarter, the group is bringing in three speakers and has visited the Center for Financial Services Innovation. Schmit also said that he’s gained invaluable experience by working with high school students. “This quarter, I teach at Urban Prep Englewood three days a week, and I’ve been able to meet so many students and build so many connections while mentoring them on important financial lessons. I really feel like a part of their community and their school and I’ve loved getting to know the young men. I wouldn’t give up my time in the classroom with these students for the world,” he said.